Why don't you take advantage of our guaranteed low prices and order these custom printed playing cards for your next campaign? You can personalize these playing cards with your logo and hand them to kids who are getting bored in the company of elders. 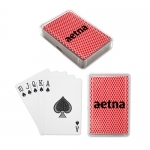 There is no limit of promotional possibilities that pack of these playing cards offer. You can gift them to kids during trade shows, company outings, school events, family reunions, parties or other outdoor events. Playing cards are also popular with elders, so it will take no time for your brand logo to get popular with kids and adults alike. Shop at Promo4kids.com to receive attractive price benefits on bulk orders! Apart from high-quality products, you can expect freebies such as free online design proof and free artwork assistance. Our fast production times and fast shipping facilities will keep you equipped for the next event on a short notice. Have you ever thought what is so special about promotional playing cards? Let us tell you that many American marketers agree that these custom printed playing cards are a great way to promote their services because they are of convenient size, lightweight, affordable, unique and memorable. Rest assured that kids who get imprinted pack of cards will remember your brand name and discuss it with their parents and friends, too. 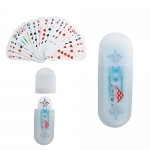 Although many of the promotional giveaways for kids offered at Promo4kids.com are appreciated by parents for keeping their kids engaged, these playing cards will keep them engaged, too. Handing out a pack of personalized playing cards is a great way to promote your services as well as they make great personal gifts, too. It is not necessary that you always print them with your brand logo, slogan or address. You can even offer them as alternative party invitations or favor gifts. 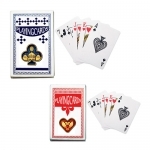 Personalized playing cards make impressive gifts on many occasions such as wedding thank you gifts, anniversary gifts, annual event gifts and reunion gifts. Whatever be the reason to gift these playing cards, it is sure that these will draw attention to your brand. Many times, marketers struggle to make people take note of their campaign and logo. 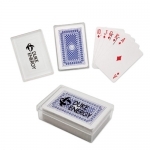 However, custom printed playing cards are one of the most-in-your-face ways of taking people take note of your brand and they offer a large imprint area for your brand logo. If you are unable to find the right giveaway for kids or fail to decide what are best for your brand, feel free to contact us at 855-454-3786 from Monday through Friday (8 AM - 6 PM EST). Alternatively, you can write to us at info@promo4kids.com.